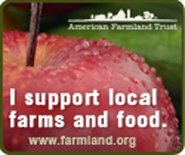 I was recently greeting by the pleasing sight of organic Cape Cod cranberries for sale at the Honest Weight Food Co-op in my hometown of Albany, New York. Last autumn, the co-op’s Produce Department wasn’t able to get a supply of this seasonal fruit from Cape Cod (a popular vacation destination for people who live in the Capital Region of upstate New York), and I settled for organic cranberries from Michigan. But this year I was able to stock up on Cape Cod cranberries. Now when I add a handful of cranberries to my morning oatmeal as it cooks on the stovetop, I can let my mind wander to the Cape. Breakfast tastes even a little bit better in that state of mind. In the mood to celebrate the holiday, it was an easy decision to bake up some cranberry pecan muffins as a special treat for Thanksgiving morning using the Cape Cod cranberries. My starting point was the ever-handy cookbook, Joy of Cooking by Irma S. Rombauer, Marion Rombauer Becker, and Ethan Becker (New York, NY: Scribner, 1997). I love the encouragement given in the cookbook: “Remember that muffins invite substitutions and inventive flavoring, and that any coffeecake, quick loaf, or corn bread batter can be made into muffins as well” (p. 782). 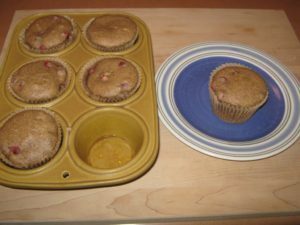 The Joy of Cooking’s Basic Muffins With Milk or Cream (p. 783) was the foundation for my “inventiveness” rooted in my desire to use organic and local foods, and of course, Cape Cod cranberries. The following recipe substitutes kefir (Redwood Hill Farm Cultured Goat Milk Kefir) for milk, Sweet Brook Farm maple syrup for sugar, sunflower seed oil (Napa Valley Naturals Organic Sunflower Oil) for butter and includes the flavors of cranberries, pecans, cinnamon, nutmeg, and orange peel. I also substituted a 1/2 cup of organic blue corn meal for 1/2 cup of whole wheat pastry flour. For some time, I’ve been sprinkling some grated organic orange peel in my morning oatmeal as it cooks, and a recent article in Parade Magazine (11/4/16) by Stacy Colino, Peel Appeal: The Nutritional Benefits of Fruit and Veggie Skins confirms this flavor boost to my breakfast oatmeal. 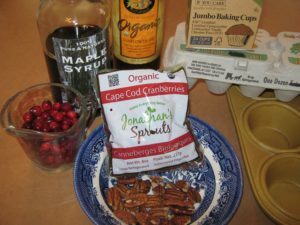 Made sense for me to include orange peel in this recipe for cranberry pecan muffles as well, for the nutritional and flavor boost. Add the “wet” ingredients to the flour mixture and mix until the dry ingredients are moistened but don’t overmix. 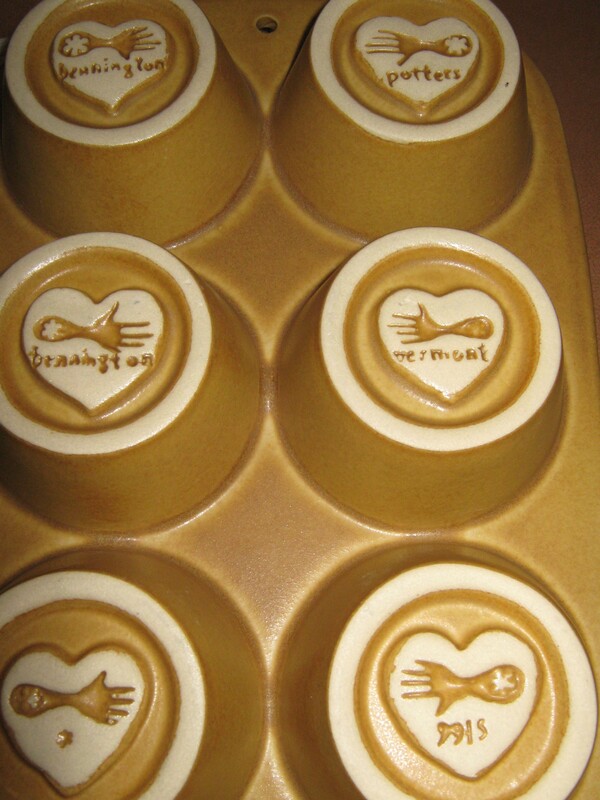 Divide the batter among the six muffin cups. I lined my beautiful Bennington Potters stoneware muffin pan with If You Care jumbo baking cups (certified compostable, unbleached and totally chlorine-free), which made for an easy clean-up. Bake in an oven, preheated to 375 degrees (slightly reduced from 400 degrees recommended in Joy of Cooking) on the advice of cookbook author Katie Webster, who notes that maple syrup may cause baked goods to brown more quickly and decreasing the oven temperature by 25 degrees will usually help prevent that from happening. The Joy of Cooking cookbook also notes that muffin pan sizes vary, and baking times vary with them. For a jumbo muffin, after 25 minutes, check for doneness by inserting a toothpick in 1 or 2 of the muffins and if it “comes our clean,” the muffins are done. Let cool for 5 minutes before removing from the pan. Enjoy a special breakfast treat for Thanksgiving.